Does Iron-Transferrin Saturation Influence the Immunoturbidimetric Determination of Human Serum Transferrin? Copper Loaded Fetal Guinea-Pig — A Model of Wilson's Disease? Do Bile Acid Receptors Exist in Human Colorectal Cancer? Can We Predict the Biological Behaviour of Carcinoma of the Breast Using Monoclonal Antibodies and Auto-Antibodies? 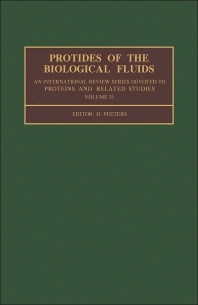 Protides of the Biological Fluids: Metal Binding Proteins, Tumor Markers, Monoclonal Antibodies covers the proceedings of the 31st Colloquium by the same title, held in Brussels, Belgium in 1983. This work is composed of three sections encompassing 245 chapters. The first section describes first the structure, physiological function, and physiopathology of metal binding proteins. This section also considers the metal binding mechanism and a series of iron binding and copper binding proteins, as well as hemopexin proteins. The second section is concerned with the physiopathology, screening, monitoring, tumor localization, and biomarkers of tumor. This section also explores the field of immunohistochemistry of biomarkers for tumor monitoring. The third section discusses drug targeting, immunohistochemistry, the identification of lymphocytes and other antigens. Considerable chapters are devoted to clinical assays of monoclonal antibodies. This book will prove useful to oncologists, protein scientists, clinicians, and researchers.